Custom decals take 10 working days to produce. 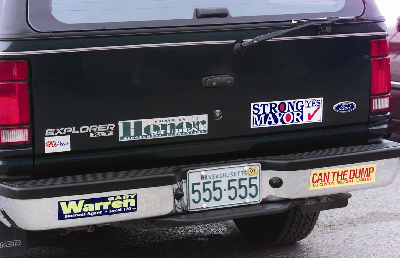 Bumper stickers are most often utilized by businesses for promotional purposes, groups expressing a point-of-view or cause or a political campaign promoting a candidate. Radio station promotions, political messages, school and event promotions are typical applications. Our removable bumper stickers are printed on FLEXmark PWVR (Promotional White Vinyl Removable). FLEXmark PWVR is a 3.25 Mil flexible white vinyl that provides durability and easy installation. The pressure-sensitive acrylic adhesive bonds well to a variety of surfaces including chrome-coated surfaces and painted plastic. The most important feature of this material is that it is easily removable for up to six months after application. The six month removability makes your bumper stickers hassel free and totally temporary should you wish, but adhesive is also rated for two years out doors, should your cause need more time. We Screen Print our removable Bumper Stickers with the best quality solvent based inks, for the longest lasting outdoor print available. The printing on these bumper sticker will not fade or scratch off.